Before we can begin the dental implant placement and restoration process, preparatory treatments are often necessary. 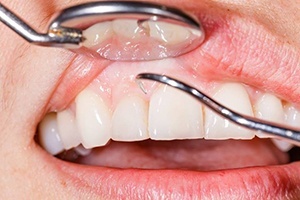 Extracting one or more damaged teeth is the most common form or preparation, but tissue grafting is a close second. To give patients the best possible chances for successful implantation, we may recommend a bone or soft tissue graft. This added supportive structure improves the chances that dental implant placement will be effective and that implant posts will stay firmly in place for years to come. 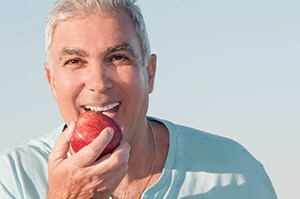 Keep reading to learn more about advanced dental implant procedures, including bone and gum grafts, from the Florham Park, NJ team at Metropolitan Periodontics & Implantology. If you have questions or want to learn more, call our specialty dental office in Florham Park to schedule your tooth replacement consultation today. After the loss of one or more teeth, the missing tooth roots mean supportive bone and gum tissue does not receive the necessary stimulus to maintain its full, healthy structure. Overtime, nutrients that would typically maintain the density of supportive bone and the volume of gum tissue will be redirected to other parts of the body, and the supportive tissue will be resorbed. When bone or gum tissue is resorbed, there may not be adequate support for the placement of one or more dental implant posts. A bone graft can improve the chances for successful dental implant placement, ensuring the maximum chances for successful implantation and long lasting restoration. There are many different kinds of bone grafts that can increase the height and width of the jawbone or preserve supportive alveolar bone tissue following the loss of a tooth. Sinus lifts are one of the most common types of bone grafts. The large, empty sinus space above the upper jaw is the most likely to need bone grafting to ensure successful implant placement. A sinus lift allows us to fill in some of the empty space, lifting the sinus cavity higher and giving the dental implant a greater amount of bone structure to fuse with. In addition to improving the density and amount of available supportive bone tissue, we may also recommend soft tissue grafting. These grafts may improve the chances for successful dental implant placement, and in some cases, they may also improve the appearance of the smile after dental implant placement. We can use soft tissue from your palate, the top of your mouth, or from a donor bank to build up the amount of gum tissue.